I couldn’t help myself, I had to somehow work the word “bee” into the title of this week’s blog! Hehe! Last week I received a phone call from an unknown phone number and the person never left a message. I thought that it would be one of those awful calls and you all know how they go: “We know that you have nothing better to do, so we thought that you’d like to participate in a survey”. As they didn’t bother leaving a message, I didn’t bother finding out what it was all about. Then the following day at about the same time they phoned again. I thought to myself, not again, so I steeled myself to deal to them thoroughly and send them packing on their way. 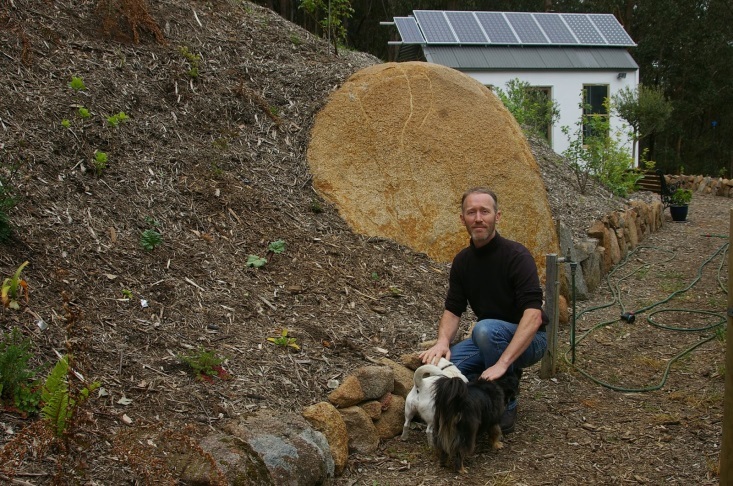 What a surprise to find that it was Robert from Bee Sustainable in Melbourne* calling to let me know that my new bee colony was ready to pick up. Glad I took that call, and I quickly arranged a time to pick up the colony. There is a general rule which seems true to me that states that you have to kill a plant or animal at least three times before you can actually say that you know something about that particular plant or animal. European honey bees have been a complete disaster here. Actually they’re a bit of disaster everywhere across the planet as humans have made a right mess of that species. 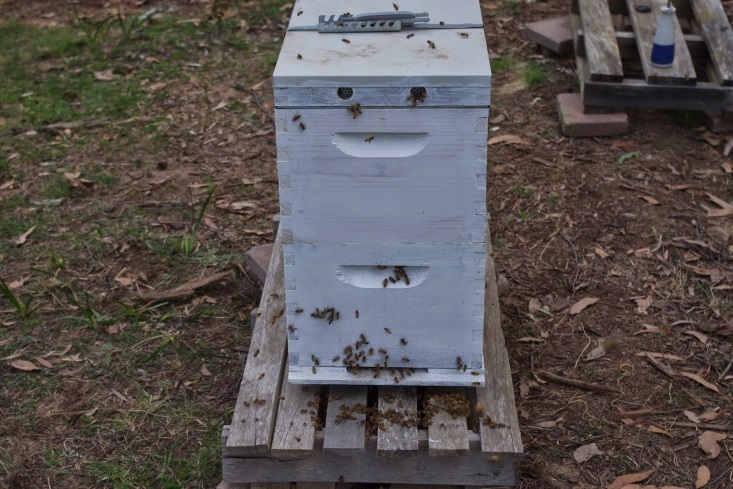 Anyway, my story with bees began about two years ago, when I purchased a hive from a commercial producer. My first mistake was that the commercial producer sold me a hive with an old queen, although this was unbeknownst to me at the time. I did originally read lots of books on bees, but the reality is always – like everything else – a little more complicated than that. The second mistake I made was that all of the books that I read at that time advised me to place the hive in a sunny spot. In the meantime a local guy that I know gifted me another colony and things were looking up for some serious honey production at the farm here. Honey is really good because not only is it the major source of sugar in cool temperate climates, but it also produces the tasty drop “Mead” which over the past few years has become something of a production line here. To be completely honest, the old queen was lacklustre, but the colony was still going strong and with another colony on hand I was feeling on top of the world. Over confidence possibly led me to thinking of myself as King of Bee Mountain! I was thinking to myself: “this bee stuff is 100% too easy”. Then last summer it all went horribly wrong, with one heat wave after another, culminating in 3 days in a row in excess of 40’C (104’F) degrees with the final of those just shy of 45’C (113’F) degrees. It was feral hot that January and I’d had enough of the heat by then too. However, during that time, the bee colonies, which were in the full sun fared far worse. The colonies didn’t die, they just went: “stuff this for a joke”. They then swarmed which is a process whereby they head out to cooler parts of the forest in order to continue their happy existence. Just to taunt me, they still return whenever the sun is shining to assist with pollination and also sup on the nectar and pollen here at the farm. Yay for them! I’ve since learned that many commercial bee keepers in this part of the world lost their colonies too as the wax and honey in the hives literally melted during those extreme heat days killing the bees and destroying the colonies. So I fed the bees and that was when I finally killed the remaining colony. The reason for that was because the original bees from here which had swarmed off into the nearby forest decided that they could use that sugar and water syrup much better to facilitate setting up their new colony. The original bees simply turned up and killed the remainder of the colony in my hives to get at the easy and weakly defended awesome 100% too good food source. There is certainly a lesson in there for all those nutty prepper types out there! Incidentally, after these disastrous incidents I had nothing to lose so I then proceeded to read every left of centre books about bee-keeping that I could get my hands on. They hooked me in early on because in one of the first books that I read, there was a bit of advice that said that if you were in a hot environment: keep your bees in the full shade. I had a serious “Doh” moment! Fast forward to more recent times and a brief and chance conversation ended up with the phone call about the new bee colony. A nucleus is just a fancy name (I do hate all of these technical names that people like to use as it is just one more thing to have to remember) for a small hive. Instead of the usual 8 or even 10 frames, there are just 5. 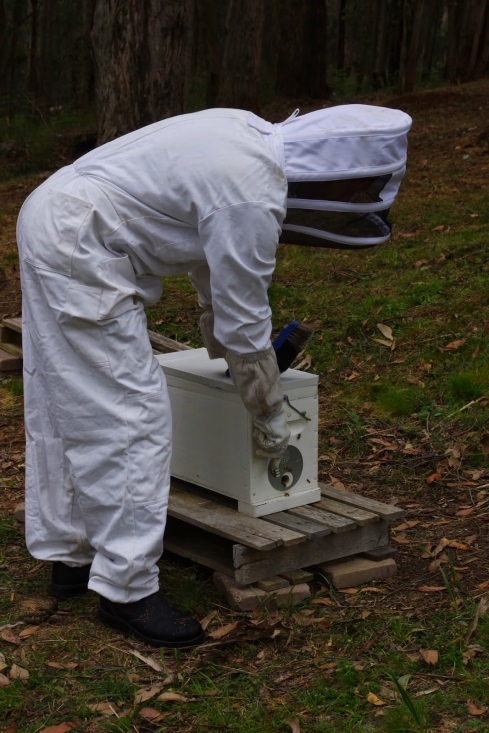 You take those frames out of the nucleus box and transfer them into a larger standard 8 frame hive box. 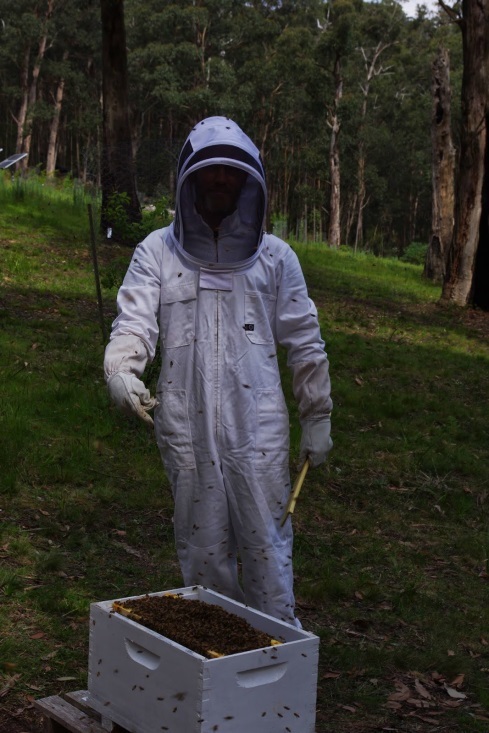 I’m truly grateful for the bee suit as the photo shows just how many times I would have been stung without it. Moving them out of their existing hive just makes the bees angry and when they’re angry, they sting. Nuff said. They seem to have forgiven me now. As the hive that I purchased was so active, I added another hive box for the Queen to lay her eggs into. There was even honey in the hive already, but I left it for the bees to eat as they’ll take time to establish themselves fully. You can tell that the state government is facing an election next month as they’re undertaking burn offs with a seriousness that I haven’t seen for many years. The farm has been covered in smoke for a few days last week from this particular burn off which covers almost 1,000ha (about 2,500ac). Water tanks with two pumps covered by steel covers. You can see just how big the trees are here! Speaking of bushfires, in the past week I’ve built rounded steel fire covers for the two pumps which are now installed on the new water tanks behind the shed. The steel pump covers were built using recycled and down grade steel and they have the added bonus of keeping the sun off the pumps themselves. It is hard for people in other part of the world to comprehend, but at the bottom of Australia the UV from sunlight is incredibly intense, so even cool days can feel far hotter than they actually are. As a fun fact, tourists from cooler areas often end up looking like lobsters after only a few days. Oh yeah, check out those new rocks in the photo too! 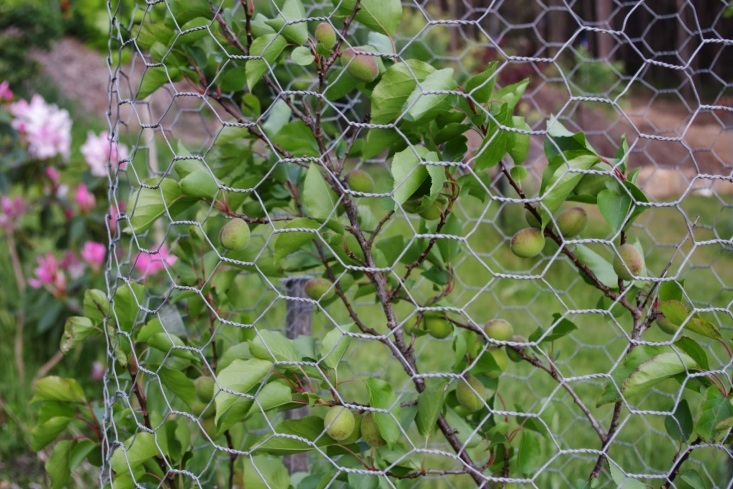 In farm news, it has been an excellent season for apricots and they are swelling nicely. I look forward to eating these exceptional fruits later this year or early next year. In the past few days, I spent half a day clearing up a huge patch of remnant rainforest at the farm here. A favourite under storey tree for me in this patch is the musk daisy bush which is a broad leaf long lived tall under story shrub of the daisy family (Olearia argophylla) which also forms dense thickets. Essentially it is a big flowering daisy bush. They’ll happily live in the shade and drip line of Eucalyptus trees too. However, dead timber from this shrub which is not in contact with the ground becomes highly flammable as it dries so they need to be cleaned up to reduce the long term fire risk and their ultimate survival. You can also see in the photo below one of the local ferns (a mother shield fern) happily living under the shade of these broad leaf daisy bushes. This week has been much warmer than any previous week since autumn. However, with warmer weather here you get subjected to thunderstorms and sudden downpours and last night was no exception. The temperature outside here at about 9.15pm is 7.8 degrees Celsius (46’F). This is half the temperature it was last night! So far this year there has been 666.4mm (26.2 inches) of rainfall which is up from last week’s total of 655.0mm (25.8 inches). *I received no discounts or freebies for mentioning Robert’s business on the blog. He’s just a good bloke with a good bee business. It has been an eventful week here at Fernglade Farm: It has both rained and the sun is shining with unmistakeable warmth. Sunburn is now a serious possibility after about 11.30am most days. The plants and trees are all growing strongly too. Plus today was something of a smashing record breaker (more on that later)! Spring is an awesome time of year here: Warm days, cool nights, plentiful rain (normally) which equals lots of plant growth. It has been interesting because there has been a bit of talk over at the ADR about insects as food source and I thought that it may be worth mentioning that the Aboriginals used to travel across various tribal areas and up into the mountainous areas of the Australian continent every year in order to catch and eat the plentiful supply of Bogong moths. A similar gathering took place around the time of harvest for the very yummy Macadamia nuts – although that was a long way north of here. Both of these foods were traditionally outstanding and reliable sources of protein and I have both the Macadamia trees and Bogong moths here. 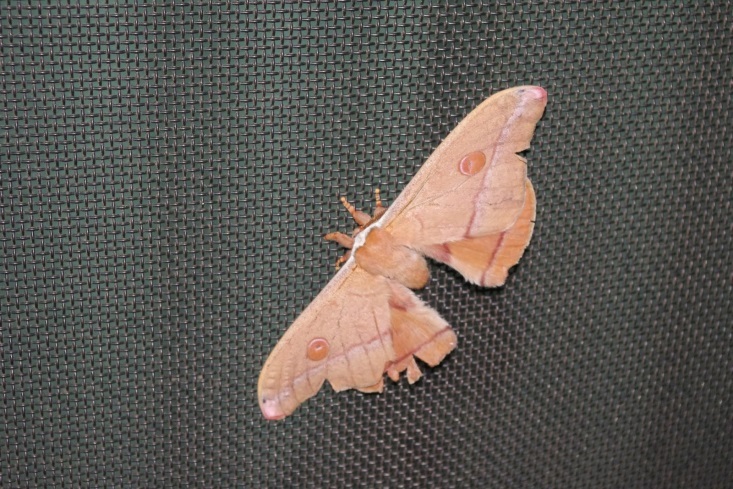 Mind you, I haven’t tried eating a moth because years ago I read of a park ranger that had partaken in an Aboriginal ceremony of catching and cooking (over coals) of the Bogong moths and he stated that they tasted like eating moths. Perhaps I’m only being a bit choosy? The moth is about the size of my hand and there is certainly a lot of meat on the body of that moth. Incidentally, if you were of the persuasion that is inclined towards eating insects, the excavations here have shown to me that there is no shortage of grubs to eat buried in the volcanic clay. The Kookaburra’s and magpies often follow me around as I occasionally feed them the grubs that I excavate out of the ground. One day, a Kookaburra here had eaten so many grubs that I was able to sneak up on it and grab it twice! Oh yeah, and stage one of the excavations is now complete. Yay! I’m quietly grateful about this turn of events as I’m unsure whether I’d be up for yet another day of digging and hauling soil anytime soon. 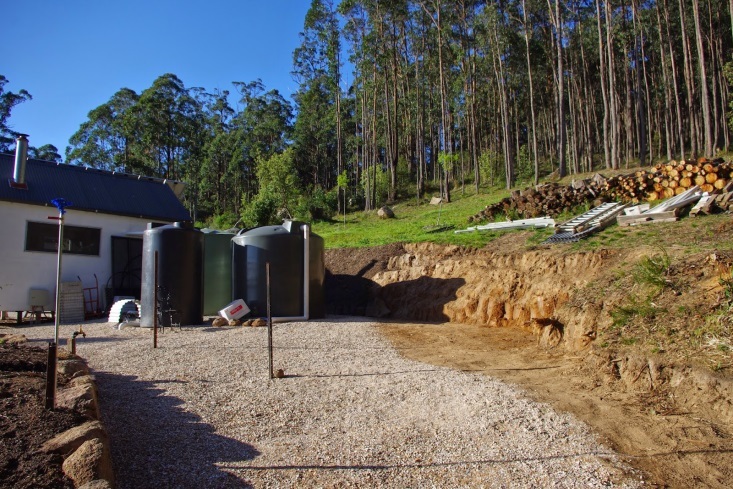 The enjoyable part of this project will be building the first steel shed. All being well this shed construction phase should start in about two weeks as I have to obtain some more materials first. Before we continue the blog though, it may be worthwhile mentioning that it is sometimes very difficult for me to estimate how long projects will actually take here. Most of the time I have no idea how long things will take as every task is so different from any task that I’d ever previously undertaken. People always ask me: How long do you reckon that project might take? The simple answer is: I’ll tell you when the job is completed! This week was no exception to that reply as I’d both assumed and stated on the record that there would only be about two hours of digging to complete the first stage of excavations this week. You know how it goes though with estimating a project: I thought that it would actually be about an hour so I doubled that time estimate just to provide a bit of leeway. Ten hours later that day though, I can only admit that I had no idea at all! Fortunately, the excavation day was both cloudy and windy, which made it feel much cooler than it actually was. Incidentally, I’m now having to wake up at sunrise in order to avoid working in the heat of the afternoon, but there was little respite that final excavation day. As they say, a camera doesn’t lie, so I captured a moment in time on that final day of excavations when I found a giant rock in the midst of all that clay. In the photo below, I’m really trying hard to smile whilst “Toothy” – so named because he likes biting people – the long haired Dachshund looks down on both me and the rock only to say “Bummer dude, I’d like to help you with that rock, but it’s just not in my job description”. As a bit of soil geek information, those rocks are called “floaters” here because they literally float through the local clay and will slowly move through that medium over a long period of time. With projects here, it is fascinating to look back in time because you never quite know what you are signing up for when you start! Anyway, I thought that it would be worth travelling down memory lane over the next few weeks and looking at the farm using before and now photos. The before and now photos are interesting because you can see how I’ve had to overcome certain site problems over the course of only a few years. As an interesting side note, I have found that it was extraordinarily difficult obtaining ideas from people on how to develop a complex site like this. Being on the side of a mountain in order to get any flat land I’ve always had to excavate into the mountain itself . For years I’d asked people from around the area how they dealt with all of the fill (left over soil) left over from the excavations. Anytime it rained heavily, the clay washed down hill and you can see how this happened in the photo below from this time four years ago. The rain that drained off the clay created small erosion channels. 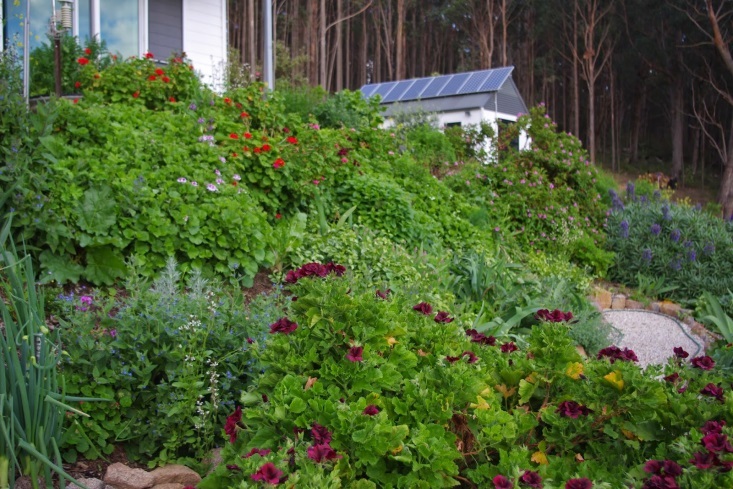 It took a lot of experimentation and observation of some of the oldest gardens in the area, but nothing held the soil in place as well as established vegetation. The very green and upper layer of vegetation is now two years old and very well established. The lower level which looks sort of grey with sparse vegetation and was established only last summer. I’ve found that woody mulch requires about two years of composting before it will grow any plant well. You’ll also notice in the above photo that I’ve installed concrete access stairs which are heavily used. 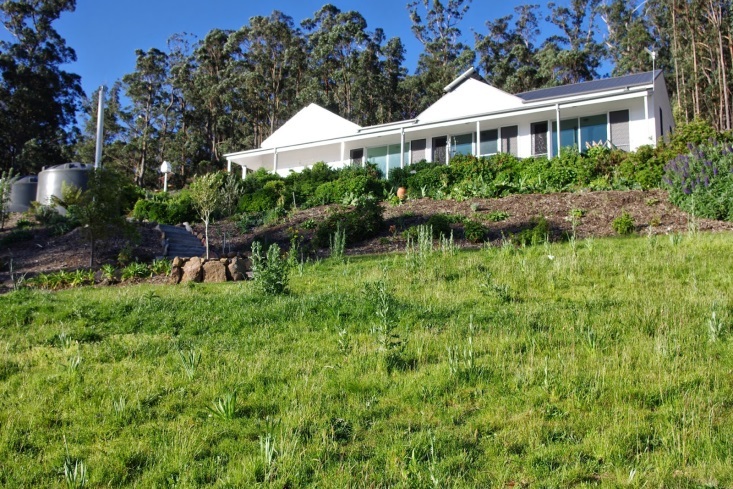 Plus the herbage on the slope below the house is very well established now, whereas four years ago it was very sparse. Behind the house I had a similar problem as the house site was cut into the side of the mountain using an excavator. Every time it rained, silt would wash down the face of the cutting and build up on the flat area next to the house. 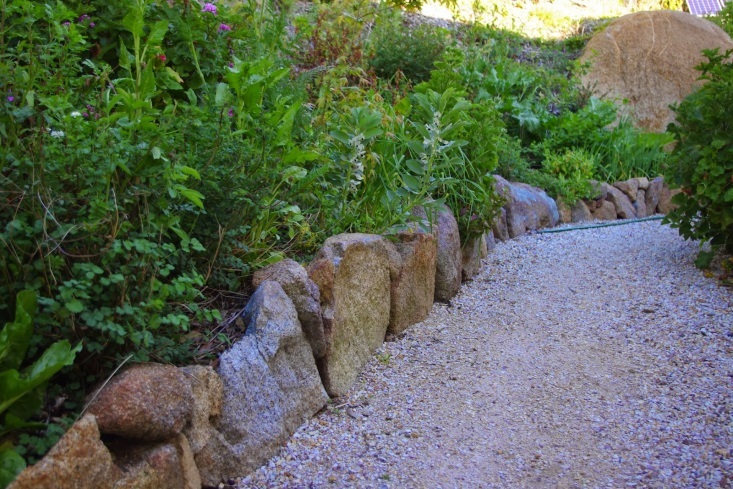 Two years ago this month, I installed a rock wall on the flat area and placed so many cubic metres (yards) of woody mulch and mushroom compost mix against the cutting that I’ve now forgotten the total tally. Today, two years later the plants have literally taken over this cutting. Hope you enjoyed the trip down memory lane! Oh yeah, the smashed record. Today after much thought, I’ve smashed all previous records for electricity consumption. This sounds mildly dodgy, but the solar power system is very inefficient in that it supplies so much more energy than I can consume most of the year. The reason for this deliberate over supply is that during the serious depths of winter for three weeks either side of the winter solstice, the solar panels make just enough energy for me to get by so that I don’t have to rely on a fossil fuel powered generator. 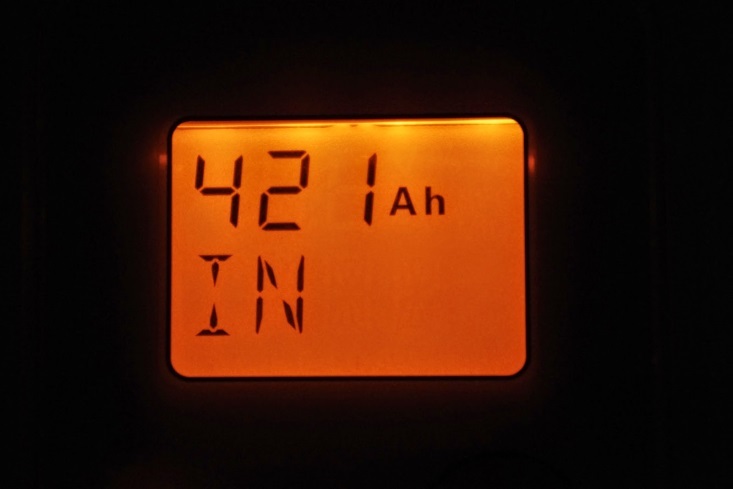 Just enough to get by is equal to about 150Ah (amp-hours) at about 27.7V (volts) which is equal to about 4.155kWh. Today however, there was so much sunlight I used the solar power in as many different ways as I could imagine and used 421Ah (amp-hours) at about 27.4V (volts) which is equal to about 11.535kWh. I believe the average household here uses about 25kWh/day. Warm air has been blowing south from the centre of the continent this week. It is interesting to note that this week Australia’s hottest town (Marble Bar in Western Australia) has recorded an average maximum temperature for the month of October so far of 40 degrees Celsius (104’F). Even though it is on the other side of the continent and a very long way up in the North West, that is where the warm air here comes from! Fortunately, cold moist air also drifts up from the Southern Ocean too and the weather here swings between the two extremes. The temperature outside here at about 9.00pm is 8.7 degrees Celsius (47.4’F) and so far this year there has been 655.0mm (25.8 inches) of rainfall which is up from last week’s total of 639.0mm (25.2 inches). Every now and then the soil releases another strange artefact to show that I’m just another in a long line of humans that have been traversing this land for many millennia. 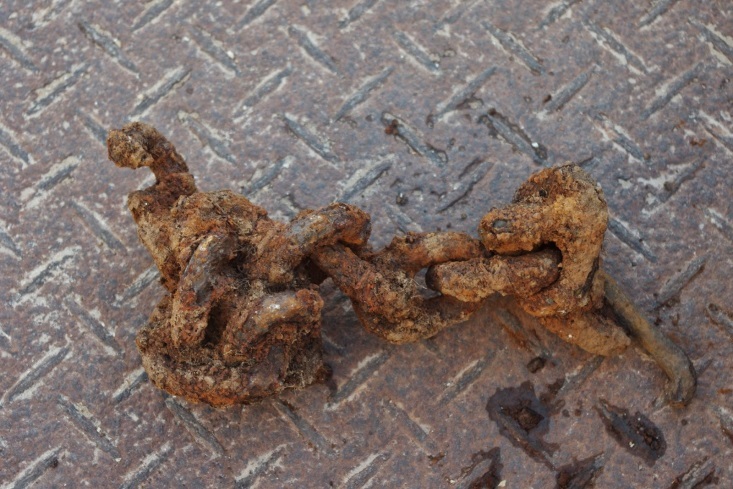 The other day I tripped over a strange old rusted heavy duty chain. The chain was in the middle of the path between the house and the chicken enclosure. I’d been walking that path for years and had never spotted it before, let alone tripped over it, and yet there was the chain poking up out of the ground. The soil had clearly decided that it was about time to eject this rusty old bit of iron. The chain was only a few links long. I don’t know much about such things, but the force required to break those chain links would have been reasonably huge. Most of the re-usable materials relating to the timber milling have long since disappeared from the mountain range (even the saw dust mounds near the mill areas have since disappeared), but every now and then, you can stumble across rusting old cables (used for winches I guess) and other mysterious bits of rusted machinery. All these items tell a story about the history of the area. It also serves as a reminder to just how quickly this particular forest can regrow. The excavations continued again this week and there is probably only a couple more hours of work before the construction of the first shed can commence. 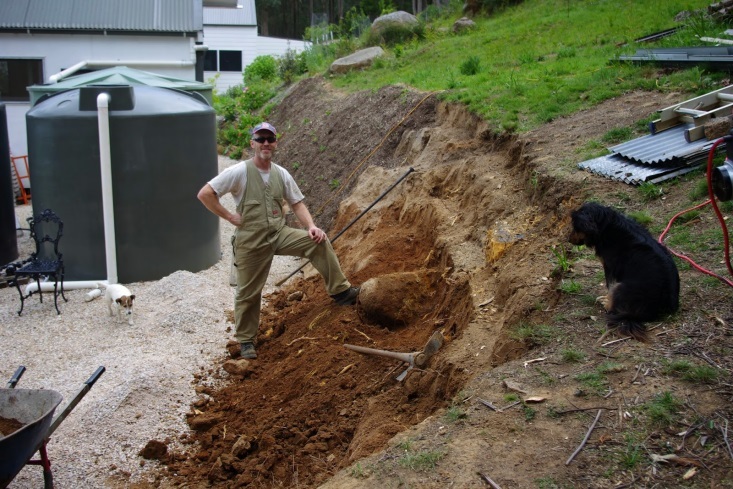 It is very exciting that the first stage of the excavating is nearing an end point because the temperature on Sunday reached just shy of 30 degrees Celsius (86’F) in the shade. By about 3pm that afternoon, I really had to call it quits. Heat exhaustion can be a serious problem during long hot afternoon’s here and it is not even summer yet! During the recent weekend, I also assisted a neighbour with cleaning up their property and burning off. Apart from the fact that the neighbours are also lovely people and giving them a helping hand is a good thing to do, their property contained areas which the naughty rats live in. Yep, they are the same naughty rats that sneak into the chicken enclosure at night to feast upon any food that the chickens have not consumed during the day. I think I’m winning the ongoing encounter with the naughty rats, but you never know as the rats adapt to new tactics quicker than I can come up with counter tactics with which to foil them. Perhaps they have been quietly reading Sun Tzu’s classic book of strategy, “The Art of War”? 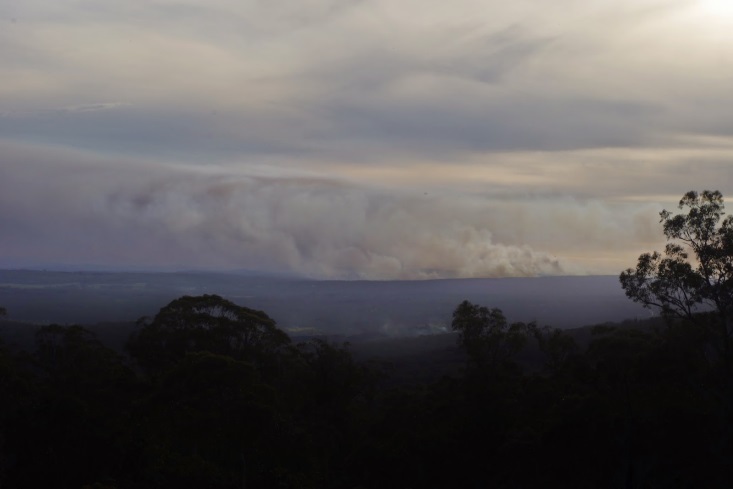 The state government has continued its strategy of large scale burn offs in the forest to the west and north of here. 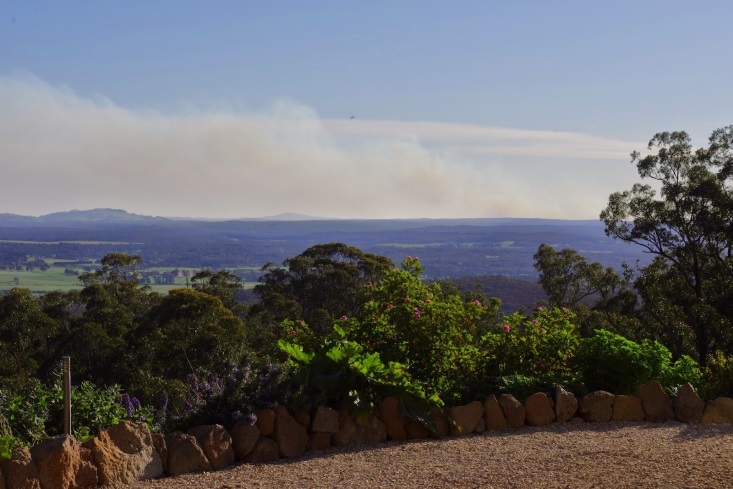 A couple of days ago, they burnt 1,000ha (2,500ac) near Greendale. This is a good thing as the burn off at this time of year (i.e. 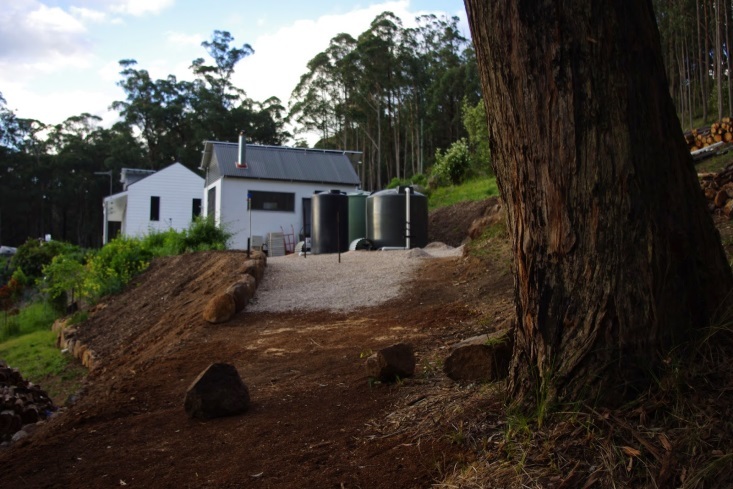 cooler) reduces the ground fuel loads within the forest and also encourages quite a bit of regeneration of plant life. This is good for both the animals and the forest itself. It is also worth mentioning that because the day was reasonably still (i.e. 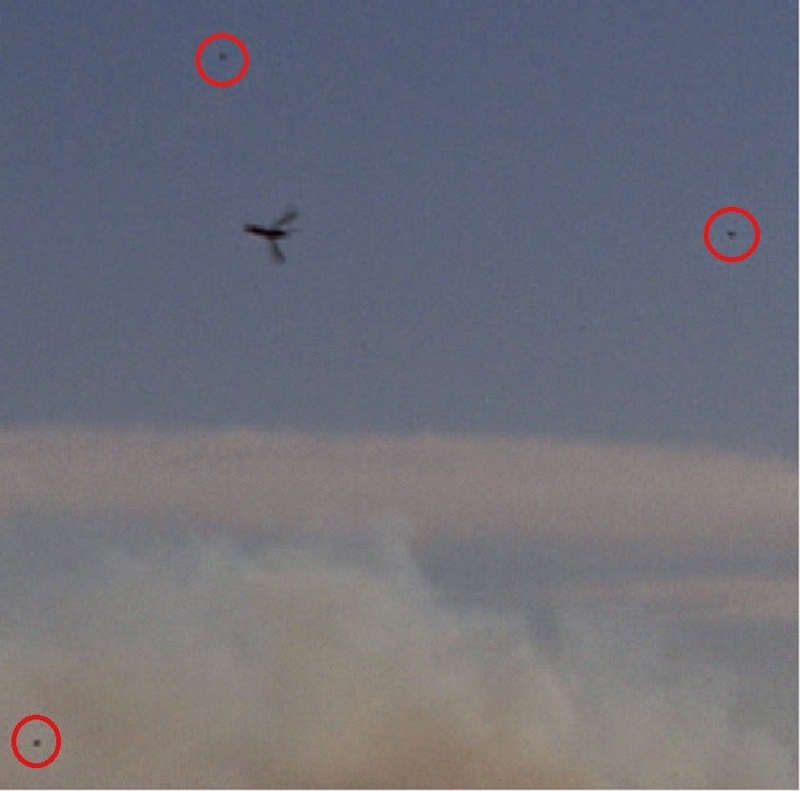 not windy) the animals would have been able to either take shelter or move ahead of the fire front. The rain which was received today, would have extinguished the fire completely. Incidentally in the upper middle section of the photograph is a wedge tail eagle happily soaring in the thermal currents above the Barringo valley. 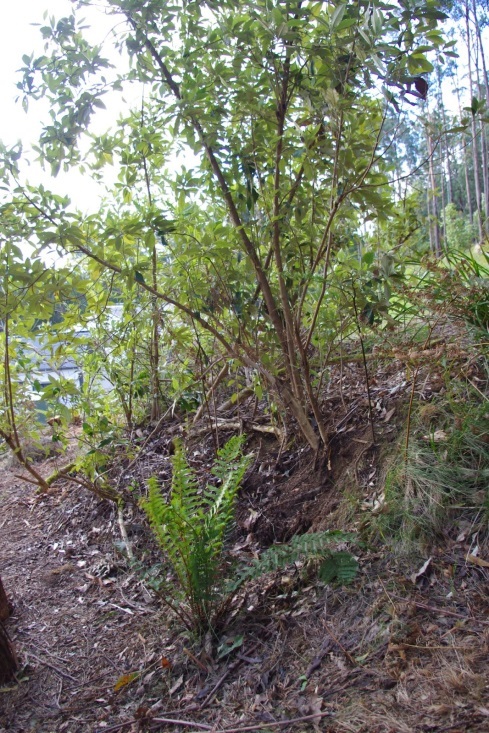 I realise that to many people, it may sound counter intuitive to actively burn off a forest in order to lower its risk of an even larger forest wildfire, but without completely altering the forest ecology and introducing completely new plant species, the Eucalyptus forests here have simply evolved over many millennia to have people actively involved in their lifecycles. That is just how they work. 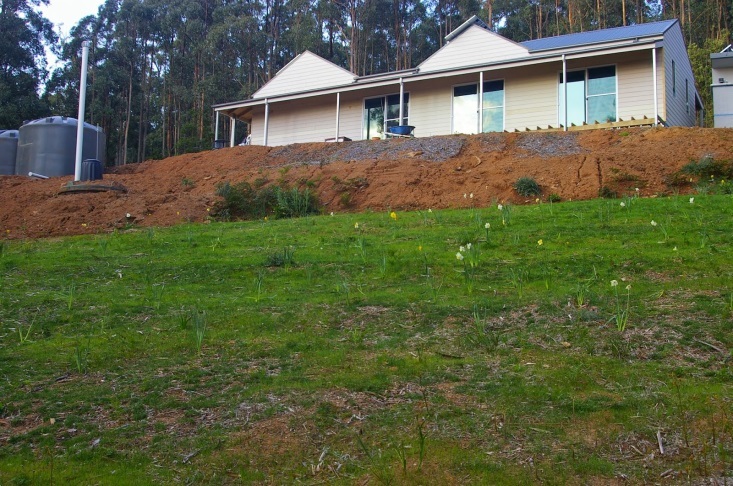 With the summer and the bushfire season fast approaching here I have installed a new bushfire sprinkler and pump this week. There is a short (2 minute) YouTube video showing the system in action. 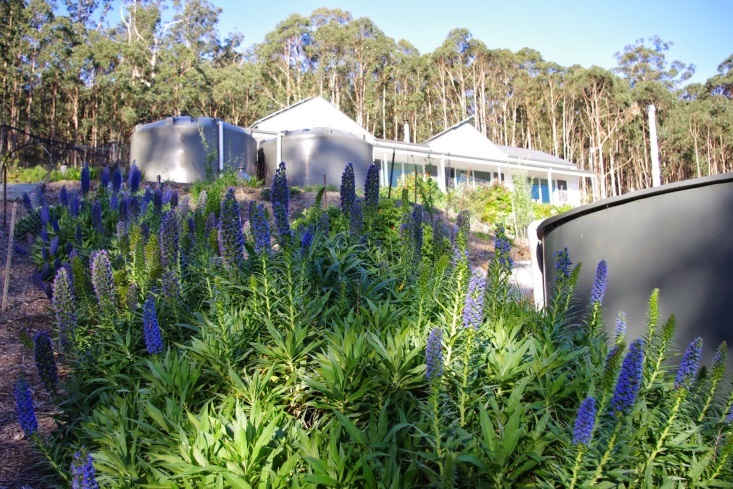 The four bushfire sprinklers sure do pump a lot of water and they are all ready to go 24/7! Plus the video from yesterday shows how green the place is looking. The flowers are covered by bees any time the sun is shining! 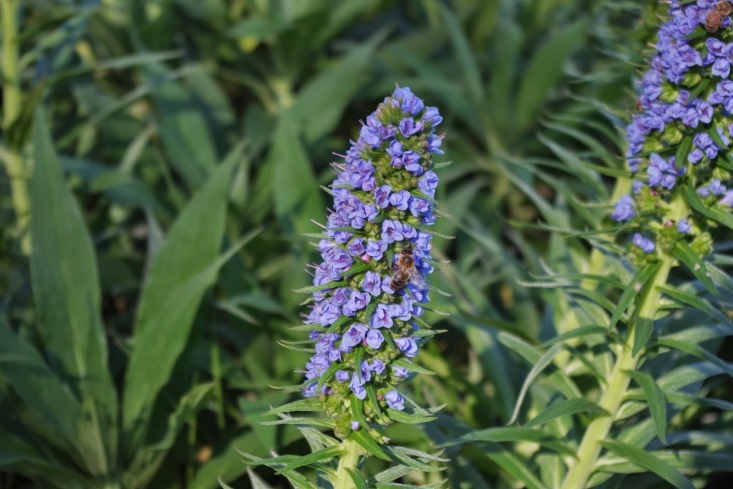 The results are now in: The Echium leaves did not burn for quite a while in the experiment and eventually just smouldered. Plants that encourage fire generally readily combust when exposed to flame. 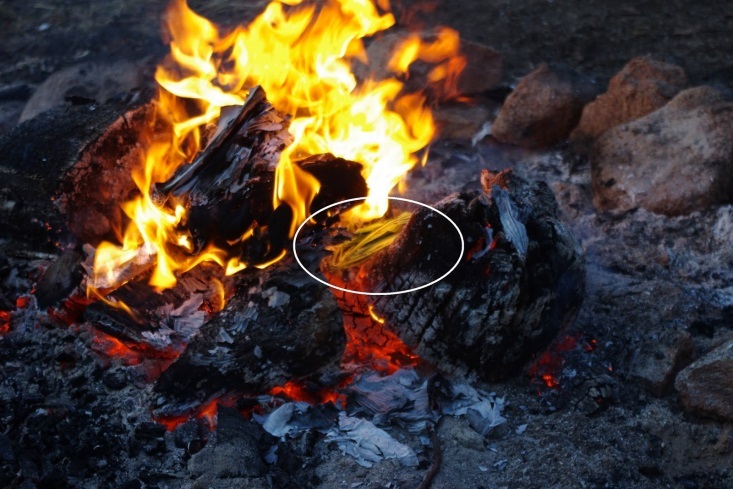 If you’ve ever seen a bunch of eucalyptus leaves thrown into a fire, you’ll know what I mean. Plant species that are reasonably resistant to fire tend to smoulder instead. This has the effect of slowing down the movement of fire from one plant to another in an area. My understanding is that this all due to a combination of the effects of oils and minerals in the leaves. More oils makes a plant more likely to combust, whilst more minerals makes it less likely to combust. I’d say that – whilst not conclusive – the experiment has shown that the Echium plant is somewhat resistant to fire. Good stuff! 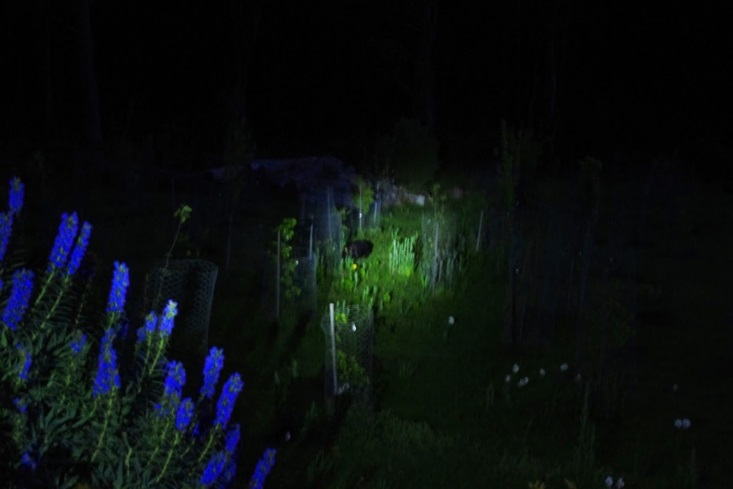 Here is a photo from the other night of a wombat cruising the herbage with an Echium in the foreground! Apologies in advance, but the next bit is truly the dodgiest segue ever: Tonight is a night that no sensible wombat would dare leave its burrow – even to sniff the Echium flowers. (I did warn you!). A blast of cold moist air has drifted north from Antarctica. It’s cold and wet outside. After the early summer advance preview screening yesterday (and that would be considered a cool day over summer), the temperature has plummeted and outside here at about 9.30pm is 2.9 degrees Celsius (37.2’F) and so far this year there has been 639.0mm (25.2 inches) of rainfall which is up from last week’s total of 622.2mm (24.5 inches).